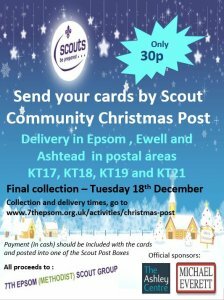 The Group runs a local Christmas Post collection and delivery service in and around Epsom during December. The service has operated successfully for many years and last year our volunteers delivered over 10,000 cards. This year the final day for posting is Tuesday 18th December. Our scheme is a successful and respected service, providing a worthwhile contribution to the local community. Please encourage your friends and neighbours to use it. Please also note that it is designed to deliver Christmas Cards and we cannot guarantee a delivery date, so please do not use it for time-sensitive material. We cover Epsom, Ewell, Stoneleigh, Cuddington, Ashtead and Epsom Downs (KT17, KT18, KT19, and KT21 post code areas). 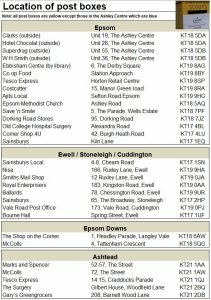 Look out for our yellow Post Boxes at these locations around the area where you can deposit your local post, along with payment per item. All the proceeds go to Scout & Guide Funds. If you have any questions or would like to help sorting or delivering the post, please email us.